Doljin, Mongolian herder, holds her dying calf inside her ger in Zavkhan province, northwest Mongolia on April, 2016. 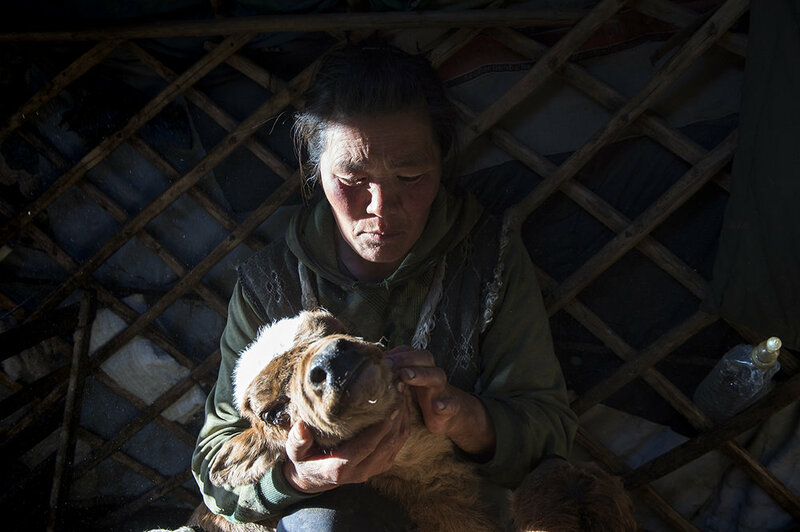 Overcome with shame at the loss of her family’s livelihood, Doljin Byambasurengiin (pictured above) finds comfort in the wisdom of her herder-father’s words. The hardy, single, 42-year old Mongolian herder lost more than 200 of her livestock to this year’s severe winter – a cyclical disaster called ‘dzud’ – during which temperatures plunged as low as minus 50° C. The effects of the bitter cold and insufficient hay fodder due to the previous summer’s drought killed at least 850,000 starving camels, horses, cows, sheep and goats across Mongolia, which is the world’s second-largest producer of raw cashmere wool. The Byambasurengiin sisters' dog eats meat off the dead bodies which the sisters keep in a pile a few minutes walk from their ger, on April 9, 2016. Mongolia’s northwest province of Zavkhan, one of the hardest-hit regions, is home to Doljin’s herd. Here, in an eerily vast tract of snowfield which is broken only by scattered patches of barren land, Doljin’s ger, a traditional round tent, gives the illusion of a speck-like miniature. There is no sign of other human life at ground level, or upon the endless snow terraces that cover the surrounding mountainsides. Anyone having their first experience on a small craft in the midst of a boundless sea might have the same sensation. The snow trail of the truck, which dropped us here and is supposed to pick us up in a few days, seems like a long-forgotten promise. Goats and other animals make occasional sounds in the distance. As the minutes pass in this soundless world, the sunlight fades to dusk and the air turns even colder. The day is ending. Doljin Byambasurengiin (L) walks with her first visiter in five months on a hill near her ger, surrounded by mountains in Zavkhan Province, northwest Mongolia, on April 9, 2016. The dzud’s thick snow has made transport difficult for herders in remote areas without a four-wheel drive, or a horse, so Doljin has seen no-one apart from her younger sister for the past five months. The wide smile of joy in meeting someone – even strangers – after such a long time speaks volumes. Her younger sister Nansalmaa, a single mother who lives with Doljin, occasionally sees two of her children at Bayantes soum center, central district. The eldest child stays with the sisters’ 75-year-old father, 12 hours away on horseback. Nansalmaa Byambasurengiin poses just outside her small ger on April 9, 2016. Spring is the animal-birth season but it is also a time of death for undernourished pregnant animals which are bearing dead infants. The problem is the lack of access to ‘vets’ to remove the bodies. Particularly weakened animals are kept inside the sisters’ tiny ger, but fate is unforgiving. Four-legged lives are lost one by one in front of their eyes. The ger – in which the sisters eat and sleep – is inevitably filled with the stench of excreta and dying animals. ‘Livestock prices are lower than they have been for the past five years, which means that people will not be able to buy food and fuel. They will also not be able to afford feed for their animals and won’t be able to save them without help.’ says Dr. Davaajargal Baasansuren, Health Promotion Program Officer at the Mongolian Red Cross, on the Red Cross website. Inversely, hay fodder prices went up, leaving cashless herders unable to afford sufficient hay stock for the winter. ‘I cried in the beginning when my cows were dying. Then I remembered my father’s words. Then I stopped worrying,’ says Doljin, whose father’s wisdom reminds her to find solace in human lives being more important. In the dzud in 1968, the snow did not melt until June and her father cleared areas of snow by hand in order to feed his animals with the grass hidden underneath. Although left with only two horses out of 400 livestock, he recovered and built up a new herd, from which Doljin’s dying animals are derived. ‘I need to prepare more hay. Not let my animals die again,’ adds Doljin, who once punched a police officer over a quarrel and is known for her toughness. Her resilience is obvious. In the worst cases, herders lose all of their animals in dzud and have to abandon herding and seek a new life in the city. Ulaanbaatar, the country’s capital, with a population of more than 1.3 million, is surrounded by ger districts with clusters of unauthorized gers and wooden houses without roads, water or sewage systems. Knowing nothing but herding and lacking in education, many displaced herders fail to find jobs and fall into extreme poverty, alcoholism and crime. Others risk their lives in dangerous illegal mining jobs. Ariunbold Baatarjav moved to Nalaikh about 10 years ago to start afresh as a private miner after losing all his livestock in a past dzud. As he explained: ‘No work to do. No animals left for me. I thought my life would improve in Nalaikh.’ He is one of dozens of former herders who use homemade machinery to scavenge for coal in the remains of the long-closed Nalaikh coal mine. The former state owned mine in Ulaanbaatar was shut down after a fatal methane gas explosion killed 21 people in 1990. Working in dangerous conditions with minimal safety measures, an unknown number of private miners lose their lives each year in accidents. Now living with his family in his ger amid the mine, Ariunbold worries that if it was the living conditions that cost his young daughter both of her eyes. ‘My daughter was fine at birth but was later diagnosed as having eye cancer. Maybe dust and pollution could be the cause.’ he says. The coal-dust dangers of living around, and working in, the mine are unknown to most former herders who depend on it for a living. Baasanbat Sainnyambuu, a 35-year old former herder, poses at dusk at the former state-owned Nalaikh coal mine, south of Ulaanbaatar, Mongolia, on April 14, 2016. Private miners rest underground at the Nalaikh coal mine on April 14, 2016. A cow looks for food on a mountainous rubbish dump in the Nalaikh coal mine site on April 14, 2016. ‘Herding animals is a 24/7 commitment. Herders work from sunrise to sunset. It’s impossible to raise animals if you are lazy and impatient. 'I was raised as a herder. Maybe that’s why I can drive for 24 hours,’ Narantuya Chadraaval, a long distance driver, explains with a big laugh. This cheerful former herder also moved to an Ulaanbaatar ger district 14 years ago. His current job pushes him drive throughout the country all year round. During a 24 hour drive from Zavkhan province to Ulaanbaatar, mostly on bumpy dirt tracks across the grasslands, he pushes through pitch darkness, with only about an hour’s break from the steering wheel. Concentration and the right choice of paths are critical. Travelling on muddy roads or crossing thick snow, rocky hills or even a river bring the life-threatening risk of accidents or getting stuck in remote areas – sometimes in dzud temperatures. The job is consuming his life. Narantuya Chadraaval, a former herder, poses for the camera inside his property in Ulaanbaatar's ger district (slum) on April 12, 2016. ‘A slow-onset disaster like this takes months to develop,’ says Hler Gudjonsson, the Beijing-based Communications Delegate for the International Federation of Red Cross and Red Crescent Societies, who recently said their initial aid distribution – of food, hay fodder, clothes and some cash assistance – took place in March and a second is currently underway. However, while a start has been made, Gudjonsson said further funding for a long term solution is needed because the cyclical nature of dzuds impact not only on agriculture but also on whole social systems.